The parent forums on Facebook are full of debate at the moment about what to do about Santa and whether or not to perpetuate the myth. I wouldn't dream of telling anyone what they should do with regards this, but if you're looking for 'middle way' ideas that allow kids to join in but without the full on deal, this post may be of interest. Nothing in it is intended to say anyone else's ideas and traditions are wrong so hopefully no offense is given, this is just our own ideas and rationale. We decided that we want the kids to know that the gifts they get are made or chosen by family and friends, not a magical stranger with the ability to give them anything in the world that they want. This means that expectations are kept realistic and there's no heartbroken children who didn't find a pony under the tree on Christmas morning. Santa doesn't come to our house because we're helping him out when he's very very busy by going to see him before Christmas. We take the boys to see Santa in his house at our zoo where he stays for a few weeks before Christmas. 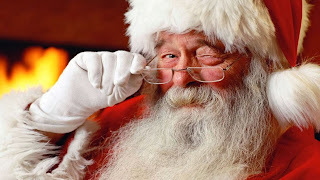 The boys get a gift from Santa, and we tell them they're really lucky because if he came to our house they wouldn't get to see him because he comes very late and they'd be asleep in bed and miss him. Toby's too young to understand and Ollie seems satisfied with this explanation so far. We have never told the boys that they must be good or they won't get Christmas presents. For us gifts are a demonstration of affection, not a bribe for behaving in a way that we would expect them to anyway. Unless you would seriously consider withholding gifts it's not a good idea to threaten it. We don't do Christmas wish lists. We ask the boys if there is anything in particular they'd like and try to keep our eyes open to any particular interests they have in the run up to Christmas. Ollie named three Octonauts toys last year that he liked, so we got one of them for his birthday last November, his grandparents got another, and the third he waited for until this year's birthday. It means that each toy is well played with and not just lost in the jumble of the toy box. We got a lovely book from a friend for his birthday last year - The Dinosaur That Pooped Out Christmas - about Santa sending a boy who was too greedy a dinosaur which ate everything. This has been a favourite all year and may be helping with Ollie's understanding of how much stuff he already has and how lucky we are. It's also something we talk about from time to time - not asking for things all the time because we have lots. When Santa asked him this year what he wanted Ollie said 'whatever's in here' holding up his parcel from Santa. When pressed did he want a car he said 'no it's OK I've got lots of stuff'. He'd wanted his Octonauts toy for so long it's like he's not bothered about anything else. Toby said 'choo choo' which is pretty much his answer to everything. I'm hoping we're getting a middle ground - the excitement of decorating the house and tree, of choosing, making and giving gifts, but without the emotional exhaustion of kids who's expectations are sky high and end up being disappointed.